The greatest accomplishments in sportfishing are far more extraordinary than a great catch alone. While angling skill is certainly at the core of the sport, captains, scientists, conservationists, writers and fishing industry leaders have all made outstanding contributions to recreational angling. 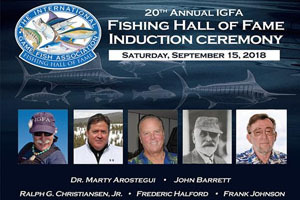 The International Game Fish Association will welcome five angling legends into the IGFA Fishing Hall of Fame this fall based on their significant contributions to the sport. The Class of 2018 includes industry innovators, world record seekers and angling pioneers: Marty Arostegui, John Barrett, Ralph G. Christiansen Jr., Frederic Halford and Frank Johnson.